Love the calculators but not the ads? Take a sneak peek at the Ad-Free Design being enjoyed by hundreds of members for less than 25¢ a week. Full details and a bonus! How to calculate percent change. A Data Record is a set of calculator entries that are stored in your web browser's Local Storage. If a Data Record is currently selected in the "Data" tab, this line will list the name you gave to that data record. If no data record is selected, or you have no entries stored for this calculator, the line will display "None". Select how many decimal places you would like the percentage change result rounded to. Note that the calculator will always give the raw result in the field provided, and then use the rounded version for the result explanation and the pie chart. Enter the beginning or past number, without non-numerical characters (commas, dollar signs, percent signs, etc.). Enter the ending or current number, without non-numerical characters (commas, dollar signs, percent signs, etc.). This is the absolute value of the difference between the beginning number and the ending number. This is the percentage difference between the two entered numbers (not the same as percentage change). This is difference of the beginning and ending numbers, over the beginning number. This is the rounded version of the result derived from calculating percent change. If you would like to save the current entries to the secure database, tap or click on the Data tab, select "New Data Record", give the data record a name, then tap or click the Save button. To save changes to previously saved entries, simply tap the Save button. Please select and "Clear" any data records you no longer need. Please note that all fields preceded by a red asterisk must be filled in. Please give the calculator a letter grade. If you grade the calculator less than A, please tell me what I would need to do to the calculator to get an A. If the calculator didn't work at all, please try downloading the latest version of Google Chrome or Firefox. Chances are, if the calculator is not working at all, you may be missing out on other content on the web due to an outdated or non-conforming web browser. What letter grade would you give the calculator on this page? If you gave the calculator less than "A", please help me improve the calculator by telling me what I would need to do for it to earn an "A". Note: If the calculator did not calculate a result, please let me know whether you are using a Mac or Windows computer, and which web browser and version number you are using. If I don't know what your set up is I have no way to find and fix the issue. All calculators have been tested to work with the latest Chrome, Firefox, and Safari web browsers (all are free to download). I gave up trying to support other web browsers because they seem to thumb their noses at widely accepted standards. If you have a question about the calculator's operation, please enter your question, your first name, and a valid email address. Note that my expertise is in creating online calculators, not necessarily in all of the subject areas they cover. While I do research each calculator's subject prior to creating and upgrading them, because I don't work in those fields on a regular basis, I eventually forget what I learned during my research. So if you have a question about the calculator's subject, please seek out the help of someone who is an expert in the subject. If the calculator is not working for you, this information will help me to find and fix the problem. Since this calculator has been tested to work with many setup and entry combinations, I probably won't be able to find and fix the problem without knowing your set-up and the data you entered into the calculator. If you reset the calculator before opening this form, please re-enter the entries that didn't work and click the Get Data button. You can clear this field if you're not comfortable sharing it and/or if the calculator is working properly for you. Who knows if I will show up in your next search. This will insure you'll always know what I've been up to and where you can find me! And don't worry. I promise not to share your email address with anyone, and will only use it to send the monthly update. You may use my email to send me "What's New" monthly update. Follow me on any of the social media sites below and be among the first to get a sneak peek at the newest and coolest calculators that are being added or updated each month. This calculator will calculate the numerical difference, percent difference, fractional change, and percent change from one number to another. Plus, unlike the majority of online percentage calculators, this calculator allows you to choose the decimal rounding, explains how it arrived at the given result, and shows a visual representation of the result in a bar chart. Note that if you would like to calculate what percent one number is of another, or calculate numbers from a percentage, please visit the Percent Calculator. Discover the benefits of subscribing to the Ad-Free Member Version of my website. Learn how I went from being trapped in a work I hated to being free to work at what I love. Select the number of decimal places you would like included in the calculated results. Enter the beginning or past number. Enter the ending or current number. Click the "Calculate Percent Change" button. This will display the calculated results, a mini-tutorial showing how the calculator arrived at the results, and a bar chart showing a visual representation of the change. If your web browser supports Local Storage, you can save your entries to your web browser so won't have to start over on your next visit. Please note that your saved entries can only be retrieved from the same device and web browser you were using when you stored them. If you would like to access your saved entries from any device I invite you to subscribe to the Ad-Free Member Version. To save your entries to your web browser, click or tap the Data tab in the Help and Tools section (mobile: top right of the main screen), select "New Data Record" from the drop-down menu, enter a name for the data record, and then tap or click the Save button. To load previously saved entries, click or tap the Data tab and select the saved data record from the drop-down menu. You can then save any changes to your entries by simply clicking the Save button while the data record is selected. To clear a named set of saved entries, click or tap the Data tab, select the saved data record from the drop-down menu, and then tap or click the Clear button. Only numeric characters (0-9 and decimal points) may be entered in numeric fields. Non-numeric characters (dollar signs, percent signs, commas, etc.) may cause calculation errors. If the field includes a grid icon, tapping the icon will open a popup keypad which will include only the characters allowed in the field. If your device keypad does not include a decimal point, use this popup keypad to enter decimal numbers where applicable. Tap the info (i) icons for a further explanation of each entry field (you can click [X] or outside of the pop-up tool tips to close them). A summary of these explanations, along with any additional term explanations, can also be found under the Terms tab. Since I can't test for every possible combination of numbers, please be sure to double-check the results of this calculator yourself before considering them to be valid. If you do discover an issue with the calculated results, please report the issue using the feedback form located below the calculator. In order to scroll the calculator vertically you will need to swipe just outside of the calculator's dark-blue border, or use the window's far right-hand scroll bar, whichever is applicable to your device. If the top section of the calculator becomes to tall for your viewport, tapping in the "Enter a problem..." field should reset the top section to its original height. The Algebra Calculator is the only calculator on the site that I did not create myself. And since I did not create it, I don't have access to the code for fixing any issues you may be experiencing. So if you are having issues with the calculator, please visit the support page at Mathway.com for assistance. A numerical expression indicating how one number compares to another. For example, to numerically express what portion 5 people represent out of a group of 20 people (5/20), the 5 people would represent 25% of the group (5/20 = .25, or 25%). Clicking the "Reset" button will restore the calculator to its default settings. Calculate any amounts needed to enter into calculator. Save and retrieve entries and notes (requires HTML5 compliant web browser). If you are using the latest version of your web browser software, this feature will allow you to save your calculator entries to your web browser's local storage in between visits. This means the calculator entries can only be recalled with the same device and web browser you were using when you saved them. If you'd like to save data between devices you will need to subscribe to the Ad-Free Member Version. Save: To save a new set of calculator entries, select "New Data Record" from the dropdown list, enter a nickname for the data record, then click the "Save" button. Load: To load a previously saved set of calculator entries, simply select the name of the data record from the dropdown list. Save Changes: To save changes to a set of previously saved calculator entries, be sure the name of the data record is selected, and then click the "Save" button. Clear: To clear a saved set of entries, be sure the name of the data record is selected, and then click the "Clear" button. Click Latest button, copy data to a text-only document, then save to your hard drive. Entries saved to your web browser's Local Storage can be lost if you upgrade your web browser or accidently clear the Local Storage. This Data Backup feature allows you to backup your saved entries to a .txt file on your local hard drive so you can restore them if they go missing, or if you switch devices and/ or web browsers. To back up your saved entries, click the Latest button to display the most recent data. Then click the text field to highlight all of the text and choose Copy from your web browser's Edit menu. Next open a new text-only document (Notepad, TextEdit, etc. ), paste the copied text into the document, then save it to your hard-drive using a file name of your choosing. To restore saved entries that have gone missing, open the text file you saved them in, select and copy the data text in the file (no leading or trailing spaces), paste it into the text field in the Data Backup section, then click the Restore Data button located beneath the field. Subscribe to the Cloud level of the Ad-Free Member Version to save your entries and notes to a secure online database, allowing you to access your saved entries from any device or web browser. Sorry! The Save functions are bonus features reserved for those who allow ads to display on the page. If you would like to use the Save features, please disable ad blocking for this website and refresh the page. Or you can choose to subscribe to the Ad-Free Member Version of the site. About: Click this tab for an introduction to the calculator. Instructions: Click this tab for step-by-step instructions for using the calculator. Terms: Click this tab for a list of the descriptions that are located within each popup help button (info icons). PCalc: Click this tab for a handy "pocket" calculator you can use when you need to calculate an entry needed for the calculator. Data: Click this tab to save a set of entries or a note in between visits. Entries and notes will be stored to your web browser's local storage (if supported by your browser of choice), meaning they can only be recalled with the same device and web browser you were using when you saved them. If you'd like to save entries and notes between devices you can do so by subscribing to the Ad-Free Member Version. 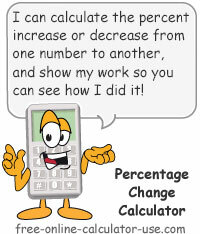 How to calculate percentage change. If you are wondering why a 500 increase results in a higher percentage change (10%) than a 500 decrease (9.09%) in the above example, it's because the denominator in the percentage change formula is always greater in the case of a percentage decrease (higher of the two numbers is the divisor). I hope my explanation has solidified your understanding of how to calculate percent change. If not, please use the feedback form beneath the calculator to let me know what questions I have left unanswered. Add or remove this page to/from my favorites. Move the slider to left and right to adjust the calculator width. Note that the Help and Tools panel will be hidden when the calculator is too wide to fit both on the screen. Moving the slider to the left will bring the instructions and tools panel back into view. Also note that some calculators will reformat to accommodate the screen size as you make the calculator wider or narrower. If the calculator is narrow, columns of entry rows will be converted to a vertical entry form, whereas a wider calculator will display columns of entry rows, and the entry fields will be smaller in size ... since they will not need to be "thumb friendly". Select Show or Hide to show or hide the popup keypad icons located next to numeric entry fields. These are generally only needed for mobile devices that don't have decimal points in their numeric keypads. So if you are on a desktop, you may find the calculator to be more user-friendly and less cluttered without them. Select Stick or Unstick to stick or unstick the help and tools panel. Selecting "Stick" will keep the panel in view while scrolling the calculator vertically. If you find that annoying, select "Unstick" to keep the panel in a stationary position. If the tools panel becomes "Unstuck" on its own, try clicking "Unstick" and then "Stick" to re-stick the panel.